Bear Paw Pizza and Market began in 2000. We are unique, being a small market that stocks the essentials, as well as home-made pizza, subs and salads. We are located in Glen Arbor, Michigan adjacent to the Sleeping Bear Dunes National Lakeshore, which was voted "The Most Beautiful Place in America," by Good Morning America in 2012. 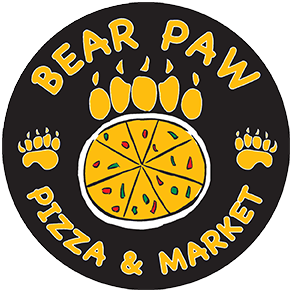 Bear Paw Pizza and Market is locally owned and operated by a friendly, helpful staff year round, seven days a week. Come in and order from our kitchen and shop around our selection of spirits, local and domestic wines or build your own six pack of craft beers. We have seating inside and out or, take your picnic to the beach or sand dunes! Come in and see our recently expanded selection of both local and domestic wines. We also have newly adjusted customer friendly prices!